Did you see a Boker damascus knife somewhere that you simply haven't been able to forget? I wouldn't be surprised; my personal favorite knife to day-dream about is the Leo Damascus model. Several other superb limited edition Boker damascus knives are also available. A Copperliner folder is available with a 300 layer Boker Damascus blade forged by Manfred Sachse. Blade length is 2 5/8". The handle scales are rare amboina wood, and the bolsters are polished nickel silver. An HK model liner-lock folding damascus knife is available in a limited edition with a 300 layer Damascus blade also forged by Manfred Sachse. Blade length is 3", handles are of African Macassar. The Boker Leo is another Gemini Style limited edition damascus folding knife. It's available with a Damascus blade forged in a small pyramid pattern by Marcus Balbach. The steel is from the barrel of a Leopard I battle tank, with chromium-manganese and vanadium tool steel added. Blade length is 3 1/8". 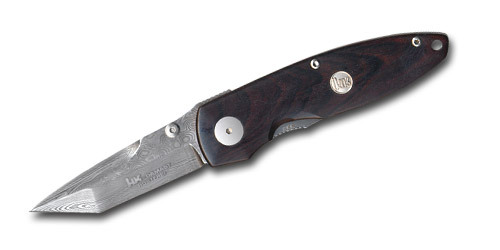 The handle is 6061-T6 aluminum, with desert ironwood inlays. I have no doubt that the premium materials and precise German craftsmanship of these beautiful Boker Damascus knives will satisfy even the most discriminating collector. Return from Boker Damascus Knife to the German Knife .com home page.